If I could bake every day, I'd be one happy girl. It doesn't really matter what I bake, I enjoy seeing the outcome and I love to make it pretty. I'm determined that my love of baking will not be deterred by my newfound healthy eating venture. The challenge is to learn to sample, as a good baker should, but not indulge. This healthy cookie recipe popped up on Anna's blog- Cookie Madness on the very day I began my journey into healthy eating. 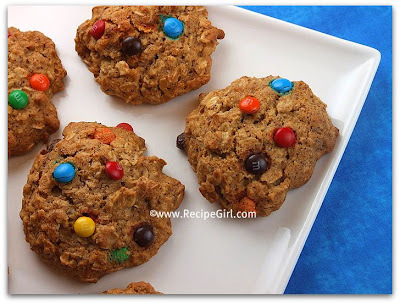 I knew it would be a good snack for my little one, and I thought it might be a nice choice for me too: Agave & Honey Oatmeal M&M Cookies. These cookies are sweetened only with honey and agave nectar. If you're not familiar with agave nectar, you can find it at Trader Joe's, Whole Foods, or other specialty or health food markets. The recipe calls for whole wheat pastry flour and toasted wheat germ. I subbed ground flaxseed for the wheat germ for a little added fiber. Anna made hers with raisins. 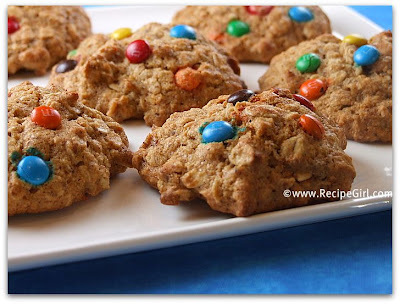 I thought I might be a bit more successful in getting my kiddo to eat these 'healthy' cookies if I left out the raisins and studded a few M&M's on top. We happened to have some of those mini M&M's leftover from Halloween. The kid had fun doing the 'studding' part, putting all of his favorite colors on 'his' cookie. 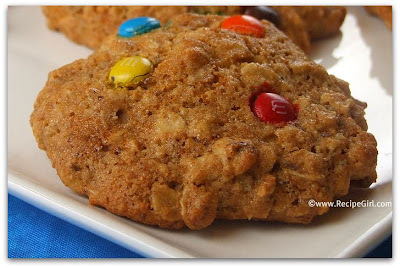 These oatmeal cookies stay pretty thick- not a lot of spreading out. They're not a crispy or cakey cookie. The texture is a little like a dense granola bar. The spattering of M&M's on top was a perfect addition to give them a bit more pizzazz and sweetness. The kiddo loved them... I've been tucking them into his lunch all week. The husband enjoyed them too. I sampled one (sans M&M's), and it sure felt like an indulgent treat after all of my wise food choices. The best part about these cookies... this recipe makes only 8 cookies- just enough so that true indulgence is barely an option. Anna's recipe for these cookies can be found here. My slightly modified version of this cookie recipe can be found HERE. If you're following my daily personal weight loss journal, check here.